You never think it will happen to your family. It's only been a story on the news – teenagers were drinking alcohol, someone lost control of a car, and young lives were cut short. The truth is that the devastation caused by underage drinking and driving can strike anyone, at any time. Every day, teenagers put themselves and others at risk when they drink and drive. Statistics show that underage drinkers often consume more alcohol at a time than adults over 21. Binge drinking can lead to brain injuries, addiction to alcohol, or even death. Many teens and young adults think they can drive after a "few" drinks, but the facts don't lie. Nearly one-third of all drunk driving deaths happen to people ages 16-20. Plus, drinking and driving isn't just dangerous to you. You're a hazard to everyone on the road. Adults: Do You Know Pennsylvania's Social Host Law? If you provide alcohol to a minor and that minor is injured or killed in an accident, you can be held responsible. If you provide alcohol to a minor and that minor kills or injures anyone else, you can be held responsible. Even if you're lucky and no accidents or injuries occur, know that providing alcohol to minors is a third degree misdemeanor. You could face hefty fines and even jail time. Take the Safe & Sober Pledge. Enter the "Words to Be Heard" Scholarship Contest. 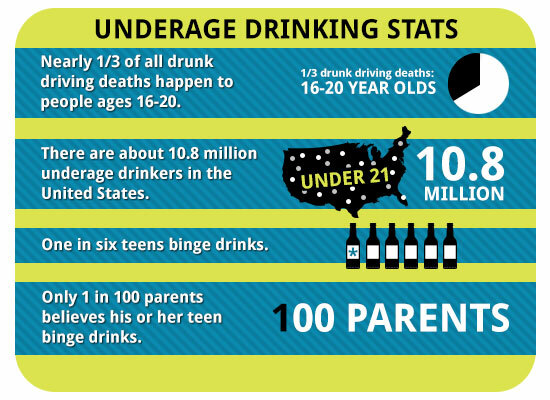 Learn the truth with our underage drinking statistics. Stay safe on prom night. If you, or someone you love, was seriously injured in an accident caused by a drunk driver or underage drinker, contact us for a no obligation, free legal consultation. We gather evidence quickly to determine who is at fault and do everything possible to get you the compensation you deserve.